The holidays are fast approaching, so is the time for great gifts for your business partners, employees, friends and family members. And we all know, picking the right gift for them can be a daunting task. That’s why we’ve created this series of guides for you. Each guide features a particular category (iOS, Mac, Gadgets) and contains hardware and software picks alike. That should give you a nice range of options, depending on your budget and needs. Chances are, you’ve probably seen this in action in one of the millions of small shops and businesses that use square as their cash register. The app itself is very simple. Even without any previous knowledge of how cash registers work, you quickly get up and running. The app also supports a number of receipt printers, cash drawers and barcode scanners. The real strength of this app lies in the web service backing it. It not only allows you to see your sales data (live) and detailed analytics but also offers the ability to manage your goods from anywhere in the world. And that’s just the tip of the iceberg. Recently, Square opened up its app to a huge number of additional countries. As a business professional who is thinking of the best gift for their friends and family, money is sometimes the best option. In the past, that meant paying a visit to an ATM, withdrawing some cash, procuring an envelope, putting a name on it and then presenting the cash gift to someone. Alternatively, you could purchase a gift card for the recipient’s favorite store, but that can sometimes lead to a situation where you’ve picked the wrong store to begin with. Enter Square Cash! With Square Cash one can simply send one via their iOS or Android apps to another user of the Square Cash app. The initiator of the transfer installs the app, validates their phone number, and then enters the recipients phone number. Square will generate a text message to the recipient stating they have been sent money and that the recipeint will need to install the app if they have not done so already. To receive the money, the recipient just has to enter in a debit card and, voila, the money is transferred to their account. The simplicity of this system makes it safe and easy to send money from one person to another rapidly so they can run out and buy their desired item! Happy Holidays! Back in March when I attended MacWorld, I discovered this really awesome little company from Germany that makes high quality wall mounts for your iOS Devices. The CEO was a really nice guy and we talked for quite a while. That’s when I discovered the sDock. The sDock is this very slick wall mount that doubles as a picture frame when it’s not in use. The front is made out of anodized aluminum so it will match the high built quality of your iOS devices nicely. It not only holds your device, it also charges it (when connected to a USB charger or an optional in-wall power supply) so it could stay in there indefinitely. And if you lock it, nobody can remove your device without ripping the whole mount of the wall. And if you need to rotate the device, it even allows you to do that. All in all, a really sleek mount, although a relatively expensive one. German engineering at its best. If you need a gift for a friend whose phone cannot and does not last the whole day, Anker has created some awesome battery packs that resolve this issue. I have been using the Anker 12800 mAh Astro 3 Battery Pack and it has gotten me through the day after using my phone to post articles, take video, and post pictures at conferences. The capacity of this device allows you to charge your iPhone 6 about five times before having to recharge the battery pack. If you are rocking an iPad that needs a charge, it can charge that gadget about 2 times. The Anker battery pack also provides a small overview of the remaining charge by gently shaking the device. 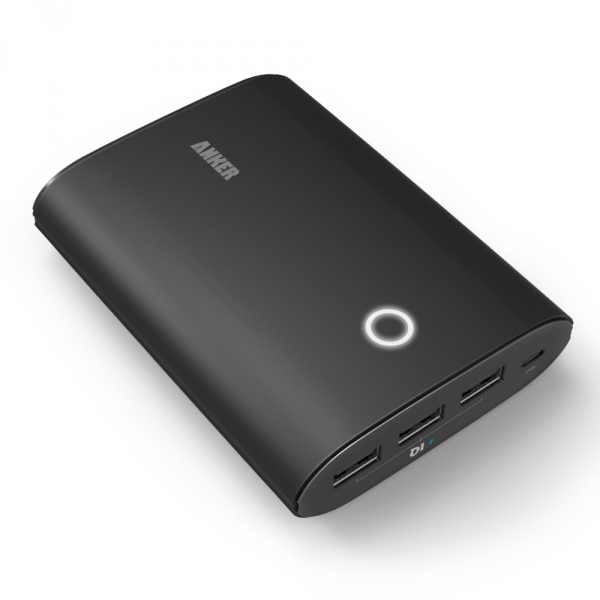 One other helpful feature is that the Anker 12800 mAh Battery Pack has ports that are intelligent enough to adjust the amperage depending on the device that is plugged in. For example, it will recognize if an iPad is hooked up and adjust the amperage accordingly. On Amazon, these devices are running about $45 which, in my opinion, is a great price for something that increases the battery life of your gadgets.